Another weak start for a scripted summer series. CBS: SALVATION premiered at 0.4, down 0.3 from the 2017 premiere and down 0.1 from the finale (both of those on Wednesdays), and lead-out ELEMENTARY dropped 0.1 to 0.5. The night started with reruns at 0.7/0.6. ABC: THE BACHELORETTE (1.4) and THE PROPOSAL (0.8) were steady. 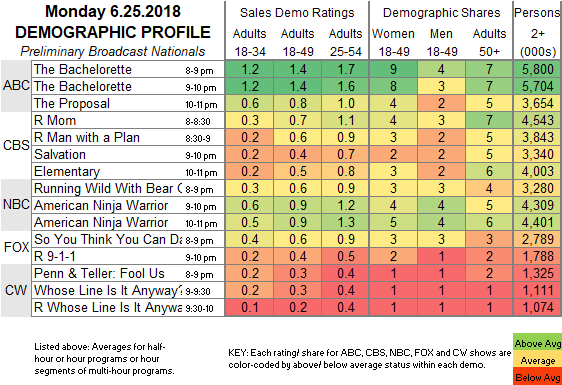 NBC: RUNNING WILD (0.6) and AMERICAN NINJA WARRIOR (0.9) were each down 0.1. 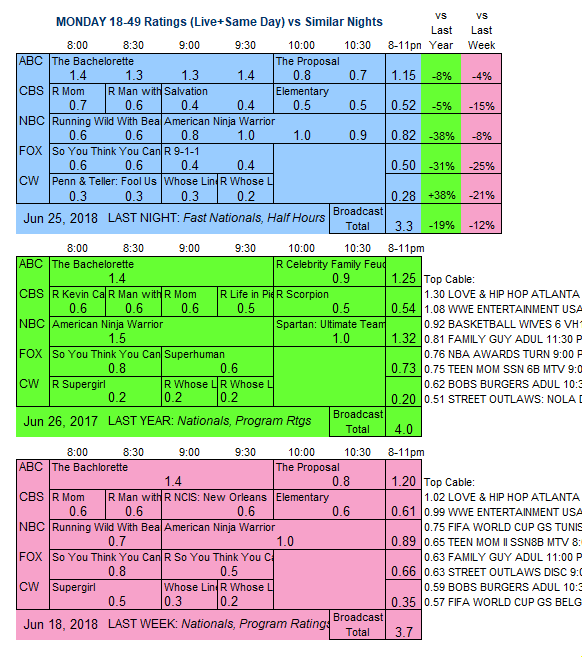 FOX: SO YOU THINK YOU CAN DANCE lost 0.2 to 0.6, followed by a 9-1-1 rerun at 0.4. CW: PENN & TELLER: FOOL US had a 0.3 season premiere, and the new WHOSE LINE IS IT ANYWAY stayed at 0.3, with a rerun at 0.2 afterward.